Because of its vining nature, cantaloupes can be trained to grow up a trellis. It saves space and helps keep the fruit off the ground. The challenge is keeping the fruit secure while it’s hanging in the air. Cantaloupe plants can’t naturally support their own heavy fruit if grown this way. With a little ingenuity, the home gardener can still make it work. People who trellis their cantaloupe usually make little bags or hammocks out of fabric or even old pantyhose to help support the growing fruit. Attach the slings to your trellis or stake, not to the vines. If you are going to grow your cantaloupes upwards, then you can plant your seedlings closer together in a row. Seedlings should be spaced about 12 inches apart. For cantaloupes that are going to spread their vines along the ground, keep the plants around 3 feet apart. Though in that case, you can plant 2 or 3 seedlings together in a small hill. 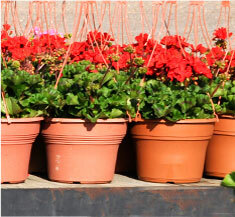 Your seedlings should go out in the garden two to three weeks after your frost date. 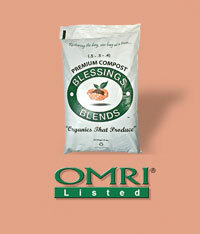 Dig the soil deeply so that it’s quite loose more than 6 inches down, and Blessings Blends OMRI-Listed Premium Compost (.5-.5-.4).